Kilian, Crawford. "Mifflin Gibbs". The Canadian Encyclopedia, 07 September 2018, Historica Canada. https://www.thecanadianencyclopedia.ca/en/article/mifflin-gibbs. Accessed 20 April 2019. Mifflin Wistar Gibbs, politician, judge, diplomat, banker, entrepreneur (born 17 April 1823 in Philadelphia, PA; died 11 July 1915, in Little Rock, AR). Gibbs was a notable figure in both American and Canadian history. 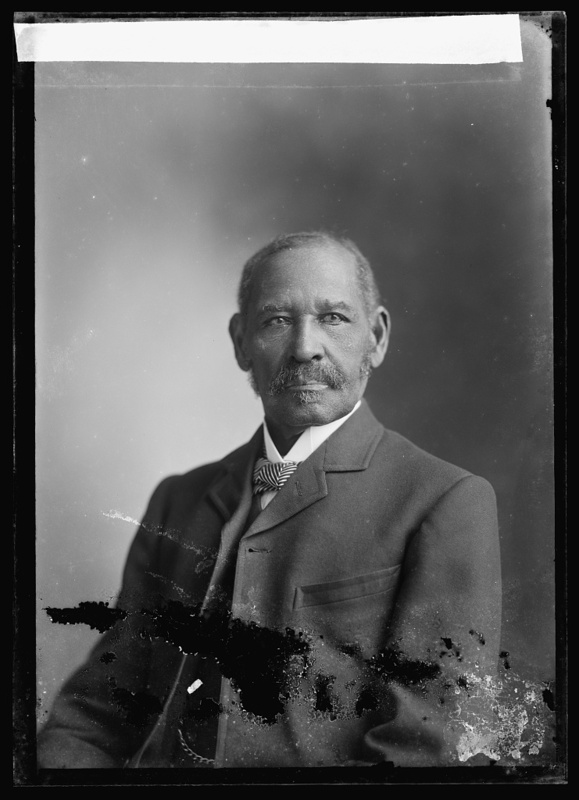 In just over a decade in colonial British Columbia, he prospered in business, advocated for the Black community, served as an elected official and helped guide British Columbia into Confederation. Gibbs was the first Black person elected to public office in what is now British Columbia. Born in Philadelphia, Pennsylvania on 17 April 1823, Gibbs grew up free in a poor family, working from the age of eight to help support his widowed mother and his younger brothers. With little formal education, he read voraciously as a boy and apprenticed as a carpenter. As a young man, he continued his education through membership in Black literary societies. Gibbs took part in the antislavery movement in the 1840s, worked for the underground railroad, and toured with Frederick Douglass on an abolitionist speaking tour. Seeing little opportunity in Philadelphia, Gibbs sailed to San Francisco in 1850 and worked as a carpenter before becoming a boot merchant. California was technically a free state, but the government was hostile to Blacks and tolerant of southerners who brought their slaves into the state. In 1858, the San Francisco Black community decided to seek a new home. Gibbs joined several hundred Blacks who left California after an invitation by Governor James Douglas to settle in the colony of Vancouver Island. The Fraser River gold rush had begun and Douglas needed settlers who were not Americans to balance the expected American migrants. According to the 1857 Dred Scott decision by the US Supreme Court, African Americans were not recognized as US citizens. Once in Victoria, Gibbs made money in the booming real estate market. For example, the day after he arrived in Victoria, he bought a property for $3,000. As well, he and his business partner Peter Lester were the first competitors of the Hudson’s Bay Company, selling food and equipment to miners passing through Victoria	on their way to the goldfields of the Fraser River. Prospering as a merchant, Gibbs returned to the US to court and marry Maria Ann Alexander, who had studied at Oberlin College; he may have met her during his speaking tour with Frederick Douglass. The couple settled in Victoria and had five children while he pursued various careers. Gibbs was active in colonial politics, organizing Black voters and running for office more than once. African Americans had come to the colony largely on the promise of being able to vote (see Black Voting Rights in Canada). In 1860, 18 of them, including Gibbs, voted for delegates to the House of Assembly, supporting Governor James Douglas rather than the faction led by newspaper	publisher (and future premier) Amor de Cosmos. It was a public ballot, so they were known to have swung the election to Douglas, and de Cosmos bitterly attacked them. Gibbs eloquently defended the Black voters, but later worked constructively with de Cosmos at the Yale Convention. In 1866, Gibbs became the first Black person elected to public office in what is now British Columbia when he won a seat on the Victoria City Council. (Gibbs was the second Black elected official in what is now Canada and the third in North America.) Gibbs chaired the council’s ways and means committee, paid off the city’s debt and served for a time as acting mayor (see Municipal Government). Gibbs supported Confederation when the colony of what was now British Columbia considered joining the Dominion of Canada. In 1868, Gibbs served as an elected delegate of the Confederation League for Salt Spring Island	at the Yale Convention, a meeting of 26 delegates that worked out the terms by which BC should join Confederation (see British Columbia and Confederation). In 1869, he took charge of a coal-mining project in Haida Gwaii (then called the Queen Charlotte Islands), where he built the first tramway in British Columbia to deliver coal to tidewater — an engineering and administrative challenge. He left his seat on city council while pursuing this venture. In 1867, Maria Gibbs had taken their children back to Oberlin. After he wrapped up his businesses in Victoria in 1870, Gibbs followed her there. Though their marriage was over, they seem to have maintained amicable relations. After studying law in Oberlin, Gibbs travelled across the Reconstruction South, where Blacks enjoyed some temporary political influence. Gibbs’s brother Jonathan was Florida’s Secretary of State, for example; however, he often slept in the attic of his home due to threats from the nascent Ku Klux Klan. Gibbs settled instead in Little Rock, Arkansas, where he opened a law firm in 1872. He was elected a municipal judge the next year. He worked for years as a state official for the Republican Party, and was eventually rewarded, in 1898, at the age of 75, with an appointment as US Consul in Tamatave, Madagascar. Both climate and working conditions were difficult, and in 1901 Gibbs resigned on health grounds. On his return to Little Rock, Gibbs wrote and self-published an autobiography, Shadow and Light. He also launched a new bank in 1903 to serve the Black community. It did well at first, but in his 80s his business skills had begun to fail him and the bank closed — insolvent due to mismanagement — in 1908. Gibbs paid a large settlement but managed to keep his personal fortune intact. On 11 July 1915, he died at 92. Though Mifflin Gibbs died a wealthy and influential person, even in the Jim Crow era, he did little to preserve or publicize his achievements. Even his autobiography, while reliable, leaves large parts of his life unaccounted for. Though he lived in British Columbia for little more than a decade, he managed to leave a significant impression. His political activism ensured that colonial administrators kept their promise to enfranchise Black settlers in British Columbia. By organizing a coalition of Black voters — and later gaining a seat in Victoria	city council — he helped give his community a voice in local government and access to important power structures. In 2016, the City of Victoria declared 19 November “Mifflin Wistar Gibbs Day” in honour of Gibbs becoming the first Black person elected to public office in British Columbia. In 2017, Gibbs was recognized as a person of national historic significance by Parks Canada and honoured with a bronze plaque.